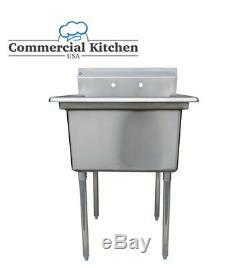 Stainless Steel 1 Compartment Sink 23.5" x 23" NSF. Royal Alliance by Royal Restaurant Group. 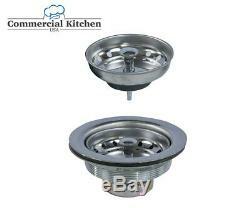 Stainless steel 1 compartment sink. Dimensions (l x w x h): 23.5" x 23" x 43-3/4. Bowl Size (l x w x h): 18" x 18" x 12. NSF Certified-meets strict standards for public health protection. Heavy-duty Constructed from 18-gauge #304 Stainless stainless steel, which is perfect for any work area. Pre-drilled 8" on-center (drilled to 1-1/4" diameter to fit standard faucets) on the 10 backsplash to accept a wall-mount faucet (faucet not included). Galvanized legs with adjustable non-marring feet. Eliminates wobble on uneven floor. The item "Stainless Steel Utility Sink for Commercial Kitchen -23.5 wide Free Shipping" is in sale since Tuesday, July 31, 2018. 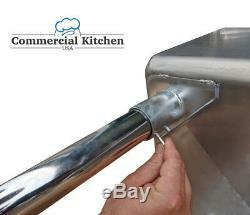 This item is in the category "Business & Industrial\Restaurant & Food Service\Commercial Kitchen Equipment\Cleaning & Warewashing\Commercial Sinks". The seller is "commercialkitchenusa" and is located in Englewood, New Jersey. This item can be shipped to United States, Canada, United Kingdom, Denmark, Romania, Slovakia, Bulgaria, Czech republic, Finland, Hungary, Latvia, Lithuania, Malta, Estonia, Australia, Greece, Portugal, Cyprus, Slovenia, Japan, China, Sweden, South Korea, Indonesia, Taiwan, South africa, Thailand, Belgium, France, Hong Kong, Ireland, Netherlands, Poland, Spain, Italy, Germany, Austria, Bahamas, Israel, Mexico, New Zealand, Philippines, Singapore, Switzerland, Norway, Saudi arabia, Ukraine, United arab emirates, Qatar, Kuwait, Bahrain, Croatia, Malaysia, Chile, Colombia, Costa rica, Dominican republic, Panama, Trinidad and tobago, Guatemala, El salvador, Honduras, Jamaica, Antigua and barbuda, Aruba, Belize, Dominica, Grenada, Saint kitts and nevis, Saint lucia, Montserrat, Turks and caicos islands, Barbados, Bangladesh, Bermuda, Brunei darussalam, Bolivia, Ecuador, Egypt, French guiana, Guernsey, Gibraltar, Guadeloupe, Iceland, Jersey, Jordan, Cambodia, Cayman islands, Liechtenstein, Sri lanka, Luxembourg, Monaco, Macao, Martinique, Maldives, Nicaragua, Oman, Peru, Pakistan, Paraguay, Reunion, Viet nam.